It was an absolutely beautiful, sunny day for our community tree planting (oops, ‘mulching’) day at the Chadstone Food Forest on Saturday. 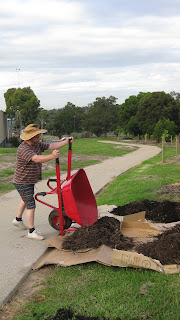 The Waverley Helpmates and Ashwood School had already done a fantastic job digging the holes, planting most of the trees, and starting the mulching on the previous Thursday – a big thank you to Heather and Michael and your respective teams (and to Patrick for facilitating). 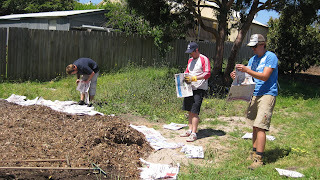 So on Saturday, all we had to do was cover the rest of the area with wet newspaper and top with a thick layer of mulch. Easy, right? Katie, Nick, Lilli and Jack for the most environmentally-friendly family transport, arriving on bikes, trailers and scooter. Heidi for the most trips up and down the hill carting mulch – a lesson in stamina and determination! Linda K and Lucien for innovation in wheelbarrow substitution. Colin – for the best snags and veggie burgers in the greater Chadstone area (and there was lots of BBQ competition around on Saturday). Mariette and Seila, who did a mad dash from working at the Ashwood College Garden to Batesford Reserve, for the most working bees that can possibly be fit into one day. And finally, a big thank you to Patrick and James, the Council contractor, for showing up early and pointing us in the right direction.